The black is just to keep the light from escaping; I guess if it were outside or in a basement, it would not be needed. To Super Green Thumb; Thank you for your support! That is exactly what I am trying to do right now. I developed a new smaller system that comes from 11 years of research @ NOAA and my own little farm. During the years @ NOAA when I had a 24-1,500 gal tank farm; I grew a total of 23 metric tons per year for 6 plus years; while cleaning 206 million gallons of eutrophic effluent from fish farms and from my own little farm of 8 million gallons out of a eutrophic watersheds up here in the Olympic Peninsula. This new modular system of 320 sq ft can clean 10 million gallons per year while growing $450,000 worth of organic certified sea vegetables. I am looking for funding for this....anybody knows where I could get this; I would be more than gracious for it. Oh and by the way; the was a comment about growing kelp in tanks...it may be possible to do so...but I need further $$ for new tank design. I have been able to sustainably grow wakame in my "normal" tank design but to make it commercially viable...I need a different design. I also have a design for cleaning up floating fish farms..but that that I will need serious funding...but it would allow us to take a TREMENDOUS amount of organic waste & carbon compounds out of the over taxed system already! But the point I want to make is that there IS a new technology out there that could supply everything for all of our needs. I don't know how many people know this but; the US imports 190,000 metric tons of dried seaweed every year that supports a thriving $2.5 billion worth of businesses...there are 350 compounds that are found in seaweed and there are 50,000 proprietary products sold in the world today that rely on compounds that are fund nowhere else. I got into this because I was federal marine biologist specializing in fisheries and during a 11 year period; I saw my share of destructive fishery practices and destruction to habitat & diversity that the federal govt allowed to happen because of the lobbyist....I wanted to help figure out how to do it in a responsible way...I found cultivating seaweed by cleaning "dirty water" before it negatively impacts the environment. everything else just fell into place. This is the future! I am beginning to build a system for backyard growing...I have had inquires from many people for this from this forum and others and I think is an additional way to allow people to grow seaweed in ways they have never thought of doing. That said; yes it grows in tanks; but definitely not what most people think and I can't get too much into it at this time because of intellectual property and I am in the middle of patenting all of it. Eventually; I hope to find the right person who could write a grant for me and the project. Everyone have a GREAT FOURTH of July! It does not help that the original tank (where this was developed) cracked. Nevertheless, here are some growth videos of the aquarium version; It hopefully will be obvious how to build it using the materials stated above. I'll still be posting plans soon, however. Spirulina is a micro algae that is extremely nutritious and easy to grow indoors. There are several tutorials on YouTube, and related "how to" books on Amazon. Can be done in an aquarium (or using bottles) connected to an air pump. Yes but this is not seaweed. Wow thanks for coming back and posting this. I only got to see first part of it so far, but it looks very impressive. Amazing how fast and how much grows -- production looks excellent. One thing to keep in mind is that this is "low" nutrient reef aquarium water. With higher nutrient water in a dedicated cultivator (adding N,P,K, Fe), production should be more. Not too much higher though, because high nutrients will make the growth darken. 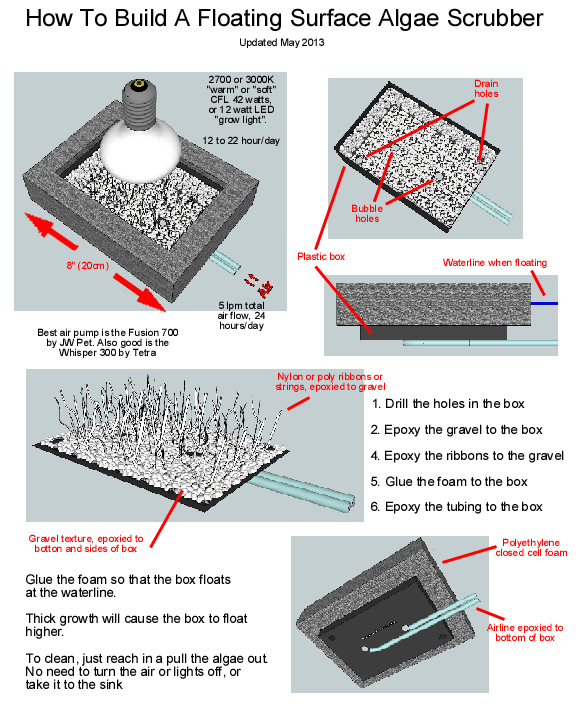 Ok finally a drawing/diagram on building a seaweed cultivator; don't mind the term "algae scrubber" since that what these are called in the aquarium world. Also, you'd probably want a substantially larger version in order to cultivate handfuls of seaweed per week. But you should get the idea. I wonder if this could be considered saltwater aquaponics? You grow yours to feed your fish, right? Do you think it's possible to grow them for human consumption? Is yours same species as nori? Have you tried different species of algae? Well it certainly is saltwater, and if you consumed the seaweed then I guess it would be aquaponics too. The ones we have in our office are growing in aquariums, and we do feed some of it to the fish, but most of the seaweed is thrown away. It could however be used as fertilizer, skin wraps, pet food, and food for us too. It taste more like iceberg lettuce. It does not grow nori, because nori is more complex to grow, but it does grow Ulva, Cladophora, and Entomorpha. The way we grow it (in an aquarium), you don't get to choose what grows because it chooses its own. But in a stand-alone cultivator you could seed the water with what you desire, and adjust the parameter of light and flow to try to grow it. Have you tried to grow seaweed before?